Keep your pets inside (especially cats). Between the risks associated with heat, firework noise and picking up inappropriate, high calorie food or those that may be toxic, it is ideal to keep your pets indoors and away from the party activity. Make sure that no more than 10% of daily calories come from treats. Stick to pet food as much as possible. We don’t want them to eat foods in addition to their regular diet, and we especially do not want them to eat the wrong things. Fatty foods can cause them to consume too many calories and can also put them at risk of pancreatitis. This can cause them to get very sick. Avoid foods that can be toxic to dogs. Encourage children to check in with you before they feed your pet. Kids may be apt to give a pet something he/she shouldn’t have. People food can add on the calories pretty quickly, so letting the children know the dangers of overfeeding dogs can not only be useful, but also lifesaving, especially if you also warn them about those foods that may be toxic or dangerous. This can make for a valuable teaching moment! Shish kabobs and other foods-on-a-stick pose a special danger to dogs. They may ingest the stick or fragments of them, which can cause blockages or gastrointestinal perforations. Avoid bones from the meat that you grill. While it may seem like a nice way to get the most of out of your meat’s bones, do not give your pet the bones to gnaw on. Your pet may choke on the bones, or the bones or bone pieces can get lodged in the esophagus or throughout the intestines, which can cause intestinal upset. This can lead to problems where your pet is not able to defecate because his/her intestines are jam packed with bone shards. On a related note, take special care to avoid your pet getting any raw meat that could harbor harmful bacteria for them just like for you and your family. Keep garbage pails covered outside. Your trash may often be covered inside, so the wide open pails at an outdoor barbecue can be an invitation for your pet to climb in, where there may be unfortunate food hazards lurking. Offer your pet healthy foods. Little known fact: Cats are lovers of zucchini. Store medications away from your pets. First aid kits may include ibuprofen or acetaminophen and should also be stored away from pets. This may be common sense, but keep your pets away from all adult beverages. 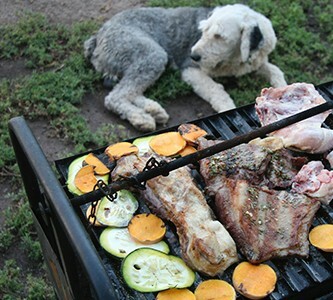 Leave your pets at home when invited to a friend’s outdoor barbecue. Most pets can be over-stimulated by new surroundings and people. Unless your pet is very well-trained and can be kept on a leash, best to keep him/her home. You’ll have a more enjoyable time and won’t be spending your time keeping him/her calm and under control. Make this an opportunity for you to enjoy some quality people time.